The Meet Setup screen is designed to set all the basic parameters that define your meet. There is a great deal of information on this screen so look it over thoroughly to ensure you have made the choices correctly for your meet. Remember if you are syncing this information to other TeamUnify teams, all of this information will push into the event creation including a map for your address and minimum age for open events. Ensure this information is accurate before you sync. Click File > Start New Meet in the menu (or press Ctrl+N). Click Yes that you're ready. The Meet Name, Headline 1 and Headline 2 are printed at the top of all reports. Pool Address — Where the meet will be hosted. This information will sync to the event and create a Google map so please type it correctly. You may type an address, click Set Default Address, and then in future meets click Use Default Address to load the address you previously set. HOST TEAM NAME — UK teams will need to pick their name from the drop down to ensure the correct code is used in Lenex files. All other teams may type in their name. Meet Dates (Start, End, Age-Up) — Pay careful attention to these dates. If they are wrong, you will have troubles with teams entering athletes with the correct times, ages, etc. Use Times Since — Use a date old enough to ensure pulling in seed times for everyone. Entry Event Limits — Include relay events if you plan to enter individuals into relays for the heat sheets. Course Order — Defaults to accepting only seed times of the pool length; conversions are NOT accepted. For example, if you select 50 METERS (L) for Pool Length, the Course Order defaults to LO — accept LCM seed times only. Change it to L (converts SCY and SCM times to LCM) or LSY (accept all three) if you wish. Type of User — Select your experience level: Novice for more explanatory pop ups or Experienced for less. Enforcement checkboxes (on right) - Parameters to be enforced by SwimOffice. Number of Pool Lanes — Important for correct seeding purposes. Sanction # — Enter in your sanction # for inclusion in all reports. Default Printers — The Primary Printer is the one used for event results to be posted and announced while the Label Printer is for award labels if you are using two printers. If you are using one printer then both printers would be designated as that printer. 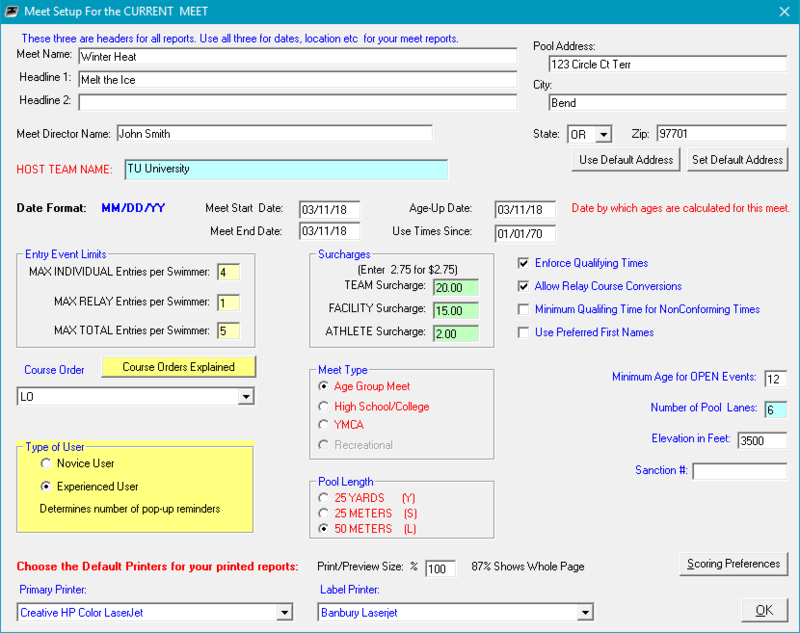 Click OK to save meet structure and confirm the pool length. Next you will need to enter your team alias, Email and Password for SwimOffice. How does a visiting team accept a TouchPad invitation?